This form is a purchase agreement for the all cash acquisition of a specified domain name and associated registration rights and intellectual property rights. All of seller’s rights in, to and under certain contracts, agreements, affiliate programs, insertion orders, licenses, and the like associated with the domain name are included in the purchase. The agreement specifically excludes certain seller assets, such as seller's equipment, any interest in real property possessed by the seller, and accounts receivable and cash held by the seller unrelated to the consideration for the sale. The sale is to be conducted through an escrow established with a domain name escrow service, in this case, Sedo.com. 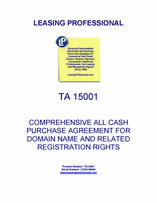 Both parties warrant that there are no fees due and payable to brokers or finders in connection with the sale of this domain name.